Whatever you are struggling with, drop it now. Let it be. You just relax. Chill. Because any attempt to solve anything in Life through a struggle will be a waste. This lifetime is not for struggling with anything. The purpose of your creation is not for you to die suffering, struggling with stuff that you have no capability to handle or no interest in. The reason why you have been created is to live joyously, to be in perpetual bliss. And there’s no point doing anything__whatever it may be__that will take you away from that bliss and plunge you into suffering! This is the simple, unadulterated, absolute truth. Even so, all of us struggle, suffer and blunder along through Life. Because we are either doing stuff that we are not capable of, or we are involved in something that we have lost interest in or we are searching for something that is not with us presently. Right from having to study a subject that simply didn’t make sense to you, you have had to struggle. For instance, I never understood Math. I struggled__and continue to struggle__with it. Someone else has a problem with History or with English or with a native language or with Biology. Our education system, at least in India, is so skewed, so flawed, that in the name of developing basic understanding in all subjects, we continue to make our kids struggle and suffer through what can be the most care-free and joyous years of their lives. At the next level, either to earn a living or to conform to societal norms, we submit ourselves to relationships which originally held promise but eventually have stopped having any meaning. So many people out there are struggling with jobs they hate doing but have to continue keeping them for cash-flow reasons! Or there are those who are trapped in personal relationships, where they stopped relating with each other long, long ago. So, while the relationships are technically alive, there’s no relating between the people in them anymore! Or, often times, there’s everything material __ but love and purpose are missing in Life! So, people struggle trying to make sense of their lives, looking for a reason, looking for love, looking for understanding, to live! Surely, there may be other scenarios where strife and suffering may prevail. This then is not a final list or the last word on how to avoid struggling through Life! But, in a small way, if this got you thinking, then you have begun to look in the direction of joy, of bliss! 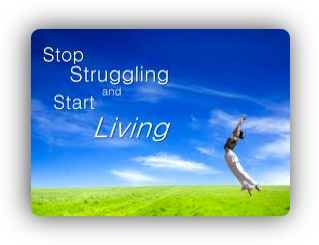 What about your Life is a struggle? What should you do to just let it be! Keep asking yourself these two questions repeatedly. The answer to the second one in itself is a no brainer. You will answer it in a jiffy. It may take you weeks and months and even years though to accept__and act on__the answer to the second question. But you have to come to that acceptance__of what must you do to stop the struggle(s) in your Life! Only when you do that will you be in bliss!